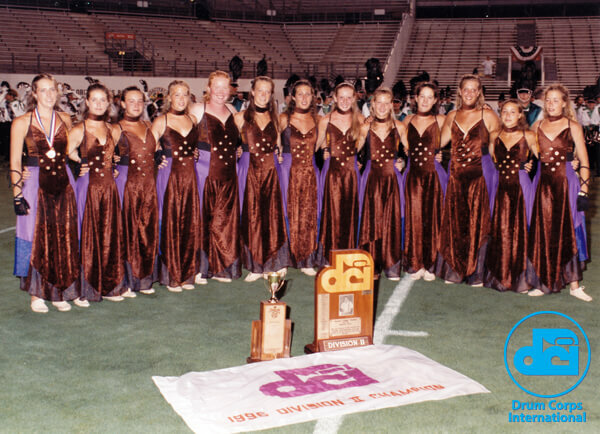 Color guard members of Les Etoiles gather for a group shot at the conclusion of the 1996 Drum Corps International Division II World Championship in Orlando, Fla. 1996 marked the first of three straight years that the Championships were held at Citrus Bowl Stadium. Hailing from Vaudreuil-Dorion, a suburb of Montreal, Les Etoiles pulled off a come-from-behind victory in Orlando. After falling behind the defending Division II Champions Pioneer by two tenths of a point in the Prelims, Les Etoiles pulled ahead in the Finals winning their first ever title, 95.50 to Pioneer's 95.30. At present day, Les Etoiles has been the last in a long line of Canadian corps to win DCI World Championship titles. Also doing so have been Les Chatelaines of Laval, Quebec (1978, 1981, 1982, 1983), Ventures of Kitchener, Ontario (1980, 1985, 1987, 1989, 1990), Dutch Boy of Kitchener, Ontario (1982), Canadian Knights of Peterborough, Ontario (1986), L'Insolite of St. Jerome, Quebec (1988), and Academie Musicale of Sherbrooke, Quebec (1990, 1995). Photo from the Drum Corps International archives. Scanning and archival services provided by DCI corporate partner WeScanFiles.com.